A common misconception is that heater boxes can't be run with aftermarket exhausts and that just isn't true. Follow along as we swap out a set of J-Tubes for a new set of heater boxes which are used with a ceramic coated header and "Fat Boy" muffler. In this video, we're going to show that hearer boxes can be run effectively with an aftermarket header system. Currently this 1967 Beetle has an EMPI ceramic coated header, and is running with a Fat boy muffler and J-tubes. The owner wants to swap the J-tubes for factory heater boxes, so follow along with us as we get them installed. To begin, we block the front wheel, jack up the rear of the car and set it up on jack stands. Underneath the car, we can see that the factory heater cables are both still in place, next to the transmission, and intact. With the help of an assistant inside, operating the right lever next to the E-Brake, the cables are working properly. Which means we can start by removing the J-tubes. Remove the two nuts at the head, for each left and right J-tube. Loosen the bolts for the clamps for each tube at the header. Slide each tube out of the header and off of the head, and remove the old exhaust gaskets. The clamps can be reused with new gasket rings but in our case we're going to install new clamp kits, so remove the old clamps as well. With the J-tubes out of the way, we can prep the new heater boxes for installation. Each heater box requires a lever kit which will hook up the box to the cables that we just showed. The lever kit consists of a lever which mounts to the box and operates the heater flap, a spring clip which holds the lever to the box, a metal strap loop with pin and clip, barrel nut, bolt, and a return spring. We also have a replacement gasket and nuts ready for the installation of the box as well. First, test fit the lever to the box, inserting the open end of the lever on to the post on the flap, and then onto the post on the box itself. Occasionally the post on the flap or on the box, can be bent in shipping. The flap can be straightened as needed to get the lever lined up. If the post on the box is out of alignment, a deep well socket can be used to straighten it out. With the lever in place, set the spring clip over the post on the heater box, and use a socket to tap the clip into place. The spring clip holds the lever to the box. Slide the metal loop in place over the lever, insert the pin through the loop and lever, and press the clip into place to secure the pin. The barrel nut and bolt will be used later so don't misplace them. The return spring is somewhat redundant as the flap mechanism has a spring inside that forces the flap closed. Just the same we will install the spring on the box on the opposite side of the lever. The spring stretches from the small lever to the attachment point on the box. This is one of the few different ways to install the return spring, but it's typically the easiest as long as the heater box has the provisions. Back to the engine, before we install the heater boxes, we need to install the heater channel tin to the engine. There are two bolts for each heater channel that would normally be in place that install from the top side of the engine, at the back side of the rear cylinders. Because those bolts install at the rear we can't install them without pulling the engine, or at least disassembling the top portion of the engine or fan shroud. Just the same we can get them bolted to the engine and the heater boxes and they will still be effective. The left side tin bolts up to the engine case with two cylinder shroud screws. The right side channel tin consists of two pieces, one sloped and one flat piece, which are bolted together with shroud screws. Screw the two pieces together loosely and then bolt them to the case with two shroud screws. As the tin is aftermarket there may be some bending and fitting needed to get the tin to sit properly in place. We use a pair of pliers to reshape the tin slightly around the exhaust ports and they are good to go. With the tins in place, install new gaskets over the head studs and then slide new camp rings and exhaust seals on the heater box. The heater boxes can now be set in place. Slide either box into the header first, then over the exhaust studs. With the box in place at the head and on the header on either side, thread the exhaust port nuts in place and tighten them up. There are two tabs that stick off of each heater box, that attach to the heater channels with shroud screws. In our case we had to bend the tabs on the left heater box slightly, to line up with the tin, before we installed and tightened the screws. On the right side, unscrew the outer screw that holds the tin pieces together and bolt the tabs to the tin and then tighten all the screws on the tin. At the header connections, set the exhaust clamps in place over the exhaust ring and seal and tighten the bolts for the clamps. An assistant can be helpful to apply pressure to the header pipe to ensure that the header is fully seated to the heater box while tightening the clamps. With both heater boxes installed the heater cables can be hooked up after sliding new heater cable tube boots in place, over the cables and onto the chassis tubes. Set the barrel nut in place through the metal loop on the heater box, slide the cable into the barrel nut, and make sure it is pulled tightly. Then tighten the bolt on the barrel nut to secure the cable to the loop and the lever. Then have an assistant pull the lever up and down to check that the cable is operating the lever and heater box properly. Then repeat the process for the opposite side. Now the heater hoses can be installed from the heater boxes to the duct on the body. Because the car has a late model engine, we had to trim about four inches off the hose which is quite simple. Unscrew the plastic cap, pull out the insulation and spring, cut the hose, push the insulation and spring into place and screw the cap back on. With the hoses cut to length slide one into place at the body. Compress the hose down a bit, and slide it into place on the heater box duct. In the engine compartment we'll have to change out the rear engine tin, as it doesn't have the holes for the fan shroud hoses. There are usually two screws at the outer edges of the tin which may be covered by the rear engine seal. In our case the screws weren't installed so we just remove the nuts and bolts for the rear engine tin, near the crank pulley, and pull the old tin out. We set the new rear engine tin in place, pull the rear engine seal up and over the tin. Then install the outer shroud screws as well as the screws, nuts, and bolts at the pulley tin. If your car has them remove the fan shroud plugs with whichever tool is appropriate. In our case the plugs were just pressed in place so a large screwdriver works to push in an edge so they can be removed. If your fan shroud doesn't have heater ducts, you'll need to swap it out for a fan shroud with heater ducts to operate the heaters. Pull out any dust and debris in the ports, and it isn't a bad idea to start the engine up and let the fan blow out the ducts as well. Once the shroud is cleared, new fan shroud hoses can be installed from the shroud. Through the rear engine tin, directed around the header pipe, and connected to the ducts on the heater boxes. With the hoses test fit, pull the hose off the shroud, slide fresh air hose seals onto each hose, and push the seal all the way down to the rear engine tin. It isn't necessary to clamp the hoses in place but we add them for a bit of security at the fan shroud and at the heater boxes. The rear of the car can be jacked up and the stands can be removed, and that completes the installation of the heater boxes. Now this car will have heaters, for our crisp so-cal winter mornings. 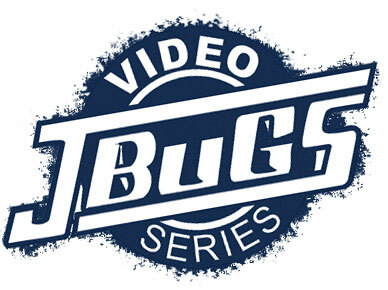 Thanks for watching and be sure to stop by JBugs.com for other tech videos tips, and of course all your vintage Volkswagen parts and accessories.